ØY – A three day festival of islands (November 18/19/20 – 2016) exploring island magnetism “invited a selection of artists, writers and film makers to give their own evidence as to why islands are so magnetic in whatever form they like”. #selkie was one of the works featured during the ØY Festival at The Kelp Store and Beltane House – Papa Westray, Orkney. Tucked high away in the remotest bits of Scotland, the Orkney islands have a mythical place in the imagination. I choose to look at the special place seals have to the people of Orkney, and sent up an AR origami seal. From centuries of celtic folklore to modern day furries, what is the attraction of certain animals? I’m interested in the magnetic pull animals have over the peoples of Orkney, particularly the seals. 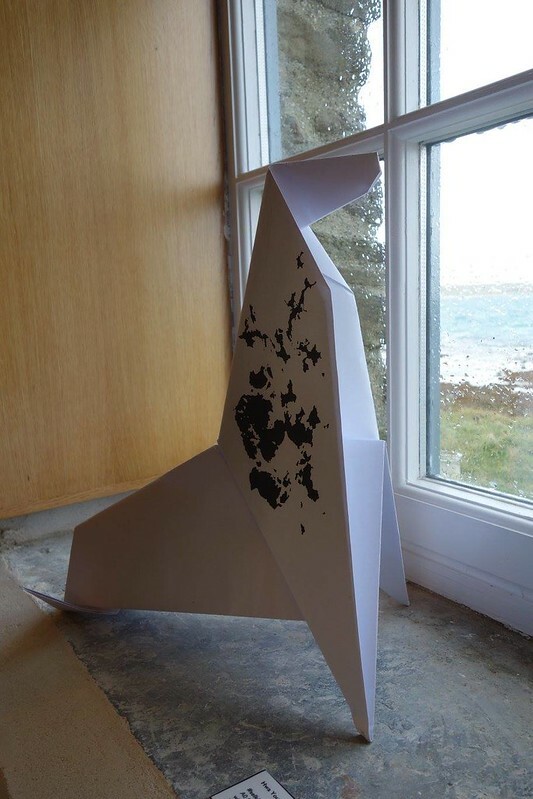 Using an abstract origami fold of a seal, #selkie explores how people project themselves onto these animals. The seal skin pattern AR marker displays tweets with #selkie from around the world. Selkie looking from The Kelp Store onto the Orkney islands. Download Wikitude (free Augmented Reality App). Focus your camera phone on the selkie skin pattern to see the thoughts of people using #selkie on twitter. Special thanks to Tor and Dave for helping with the project.